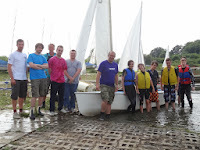 The St Edmundsbury Sailing and Canoeing Association, at Lackford Lake, were very pleased to welcome the Suffolk Scouts as new Group Members of the Club, on Sunday. A contingent of Explorer Scouts from Mildenhall and Lakenheath, accompanied by Assistant County Commissioner (Explorer Scouts) and County Training Manager Leigh Foster, were greeted by SESCA Commodore Kieron Adams. Also in attendance and helping out on the water was Nic Asher, a two time 470 World Champion and current member of the RYA British Sailing Team who is currently campaignin a ‘49er skiff towards the 2016 Olympics in Rio. Nic’s visit was sponsored by the RYA as the Club’s prize for winning the Social Media Award for promotion of SESCA’s ‘Push the Boat Out’ Open Weekend in May. The Scouts had a fun afternoon on the water with Leigh Foster commenting “We had a great time and can’t wait to get down again”. Earlier in the week, another 20 children from Stowmarket Middle School visited St Edmundsbury Sailing & Canoeing Association to have a sailing taster session as part of an Olympic legacy project to give pupils the opportunity to experience a range of Olympic sports. This proved to be as successful as the last visit and the children were equally reluctant to get off the water. Club racing on Sunday saw the fleet include six Laser dinghies on the start line for the first time, which was great to see. The weather was beautiful but with a light, shifty north easterly breeze. Commodore Kieran Adams got off to a good start but a slight navigational error allowed Jon Holmesfjord and Mike Steele, also sailing Lasers, to catch up. However, it was Mike Senior, recently returned from a spell sailing larger boats, who pulled off an audacious manoeuvre at the next mark to slip into the lead. Despite being hard pressed for the next three laps, Senior hung on to the finish giving himself line and corrected time honours. Adams finished 2nd with Steele 3rd. In the second race, Mike Senior led off the line after Steele was called back for starting early. Steele managed to recover and eventually caught up with Adams but couldn’t quite get into striking range of Senior. The Lasers finished in the top three places again, with Senior notching up his second win; Steele 2nd and Adams 3rd. Senior wasn’t able to sail in the final pursuit, which gave Kieron Adams an opportunity to secure his first win of the day and secure the overall day prize. Steele again had a bad start, leaving Ellis Blackmore and Jon Holmesfjord to have a close battle for second place in their Lasers for most of the race. However, Steele managed to catch a gust on the last leg, which allowed him to leap frog into 2nd, with Holmesfjord 3rd and Blackmore slipping to 4th.